By default, devices running Professional versions of Windows 7 or later, have offline files enabled. 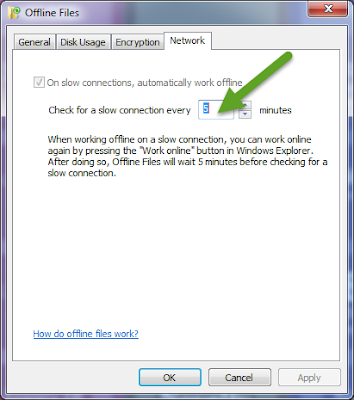 So what exactly are Windows offline files and when and how are they used? 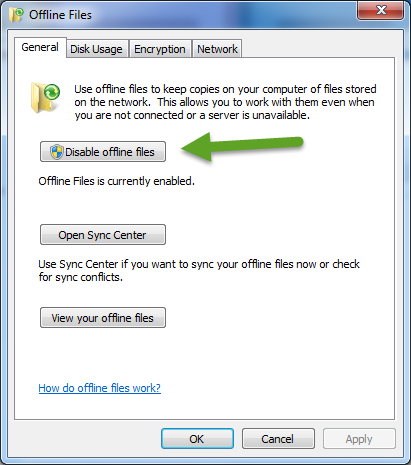 Windows offline files is a feature that provides a way to work on files stored somewhere other than the local computer, like on a business file server or workstation sharing files with multiple users in an office, even when a device is somewhere other than work. The beauty of using offline files is that the same files can be accessed, modified and saved while away from the home network where files are stored without requiring Internet access. Once the device reconnects to the home network, all new files are copied to the network location and all modified files replace their older versions. Offline files are best used on devices that are sometimes mobile. The purpose of offline files is to provide access to files normally stored in a centralized location, like on a business file server, when a device is not connected to that file server. Salespeople, or people in any position who travel, travel with a work device to take notes, track progress, communicate with customers, as well as document work completed. Offline files makes this easy without requiring Internet access. As a result, laptops, ultrabooks, and notebooks are the most common devices utilizing the offline files feature. Since desktop computers normally only leave an office when there is an issue, it rarely makes sense to enable offline files on them. Offline files works by storing a copy of the files stored on the business file server on the local device as well. This means the files are taking up storage in two places, but the amount of storage dedicated to offline files on the local device can be limited. Once a device reconnects to the business file server, modified files will replace older versions and new files are uploaded. To check the status of offline files, go to the Control Panel and select Sync Center. 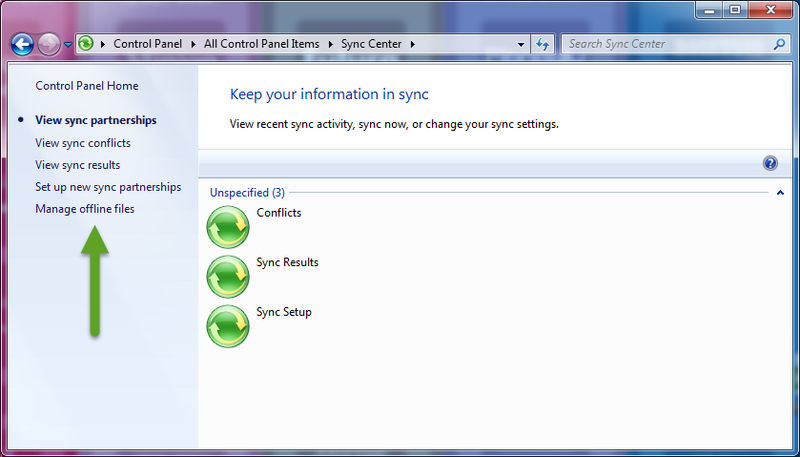 Inside the Sync Center menu, click "Manage offline files" in the left pane. NOTE: Offline files are only available on Professional versions of Windows. If you click on "Manage Offline Files" from within the Sync Center window and nothing happens, you likely have a non-Professional version of windows like Home or Home Premium. The status of offline files is displayed and can be enabled or disabled. Offline files can be viewed. The Sync Center can be opened. 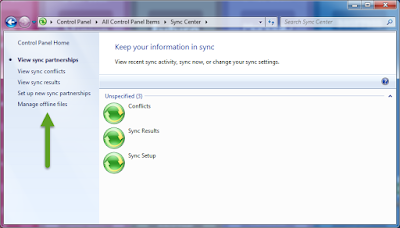 NOTE: Use the sync center to address any file sync conflicts that occur. The limits for temporary and offline files can be set by clicking "Change limits". Temporary files can be deleted. Offline files can be set to be encrypted or left unencrypted. Set the time to wait before checking again for a slow network connection when working online. NOTE: Slow connections will automatically force a device into working offline. The default time is set to wait for 5 minutes before checking for a slow connection again. Utilizing offline files on supported mobile devices is a great way to access files normally stored on a business file server or another workstation sharing files with multiple devices. Centralizing the location of files makes them easier to manage, backup and protect, and ensures the most recent version of a document is being accessed. The ability to access work files while traveling makes user's lives easier and more efficient. Finally, the hard work of tracking which versions of files are the most recent ones is done automatically by offline files. Older versions of files are automatically updated with newer versions once devices connect to the business network again. As always, simplifying how we use our tech is more efficient, reduces stress and can eliminate frustration!